Throughout the Iraq war, Rageh Omaar stood on a hotel rooftop in Baghdad and told it to us straight. We talk to the news man whose cool, calm delivery - and boyish good looks - made him a household name. Little had prepared Rageh Omaar for the reception that awaited him when he eventually left Baghdad after the fall of Saddam Hussein. For three months - almost without cease - he took the temperature of the beleaguered capital in reports seen by almost 90% of Britons on either BBC bulletins or News 24, despatches that were also syndicated widely abroad. In the process, Omaar developed quite a fan base. Viz magazine dedicated its latest issue to "Britain's best-loved bullet-dodging dreamboat". The New York Post dubbed him the Scud Stud. A website all but sold out of T-shirts bearing his noble visage. And in New Zealand, where tributes come typically low-key, a reporter with the national radio network named one of her lambs Rageh. What he finds somewhat bewildering is the interest in him as a person - indeed, when he took a break from reporting duties, the BBC received numerous e-mails inquiring as to his safety. "People come up to me on the street and say 'oh, we were so worried about you'. 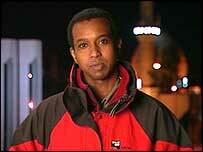 It's over-whelming, humbling, a little bit frightening as well," Omaar told BBC News Online. "And people got fixated on the oddest things, like my red fleece or the buttons on my shirt. People have said 'your reporting's great but please stop wearing that red jacket'." Was it embarrassing that of the three BBC correspondents in Baghdad - let alone the scores of journalists in the Gulf - he was the one to catch the limelight? In a word, yes, in part because those same colleagues teased him mercilessly. "They made sure my feet stayed firmly on the ground." Despite Omaar's much-vaunted cool, the human fallout of the war did rattle him. "It was a dangerous place and it was as dangerous as it looked. But there was a sense of all of us in the BBC team being responsible for each other. "And we had to try to get our news on air without getting people into trouble. We weren't supposed to have satellite equipment in our hotel but of course we did - there were raids on our rooms twice, three times a night. If we were on air, we'd just have to take the satellite phone and throw it under the bed." 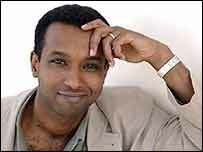 While the worst that could happen to Omaar and other correspondents was that they could be expelled from the country, there were real fears for the security of the Iraqis on the BBC team. "We had an enormous responsibility to them, they could have paid with much more than their jobs." But the long hours and the harrowing events played out before his eyes did take a toll. As Omaar recalls the day several colleagues died in an American attack on the Palestine Hotel, the main base of foreign media in the city, he lowers his head into one hand. He had been about to go on air when the shell struck the Reuters suite above, and Omaar was among those who tried to be of assistance. "I found Taras Protsyuk, the Ukrainian cameraman who died, in his room on the ground. He had suffered massive abdominal injuries - I didn't realise at the time that he was already dead. 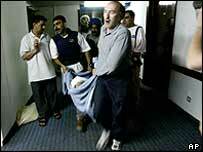 And a very close friend, Paul Pascal, suffered quite bad injuries and had already been carried out." He lifts his head, but his eyes remain closed. "That was a very, very bad day, and that affected the atmosphere. It made our fears and tensions very real." What helped Omaar keep emotional exhaustion at bay was the bonds he formed with his colleagues. "We shared the anxiety, and that helped me get through the difficult times. And I spoke to my family in Johannesburg each and every day. I kept a diary as best as I could, I read when I could, I tried to keep all those little things of reality." "If I'm in Viz, I must have made it"
When it came time to leave, Omaar found it easy to slot back into everyday life - not least because he was back on the school run and supermarket shop straight away. "It was such a closing of a chapter for me. I'd been reporting from Baghdad for seven years on Saddam Hussein's Iraq, and I emerged from a country no longer ruled by him." While his next assignment has yet to be decided - a process his wife, Nina, and their two children will have a say in - Omaar is clear about one thing. "I want to keep reporting on Iraq - it's still a very important story and I don't want to walk away from it now I've got the kudos from covering the war." So now the BBC's veteran war correspondent has stepped aside, is he the new Kate Adie? "I don't know about that. But I'm not the old Rageh Omaar." 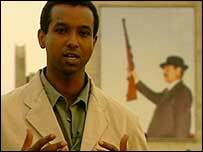 Rageh Omaar is among the BBC correspondents to contribute to the book, The Battle For Iraq, to be published on 12 June by BBC Worldwide.